On loan from STEAM, we bring you a wonderful collection of travel posters and objects from the original Great Western Railway. Artwork of the highest quality was used to sell the romance of holidays in the GWR’s territory. We have some fine examples of how a railway used colourful imagery to promote discretionary travel. In this example, Maidenhead is the destination. The railway bridge features, but the dominant theme is to encourage people to partake in pleasant summer river-days. How did people approach rail travel? There are some plainer advertisements for travel insurance to see. Picnic and tea baskets were available for purchase at GWR stations. 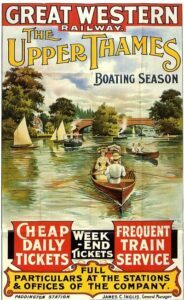 At Maidenhead you could buy only tea baskets, suggesting most customers were day trippers on the river. Porters were on-hand to help with heavy and bulky luggage. Before the days of the “Passenger Charter”, the GWR had a good time-keeping culture. The guard’s whistle was to be taken seriously. Carriages were decorated with smaller images. We display some examples from local Cookham artist Frank Sherwin. 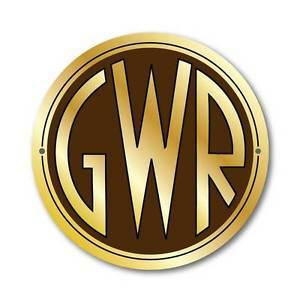 Anti-macassars, embroidered with the GWR logo, helped to protect the seats from greasy hair-oils. There were no anti-dandruff shampoos then. Monogrammed plates, cups and saucers help tell the story of people being served in restaurant cars – before the days of the factory-made sandwich and the disposable cup. 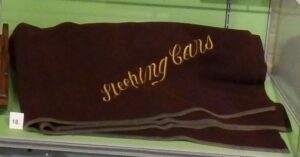 Sleeping cars were often the way to make those longer journeys to the West Country and Pembrokeshire. We have grooming products and other comforts that the GWR supplied. So come and visit! The exhibition is on until 21st April 2018. It’s free but we suggest donations of £3. When visiting, ask for your 15% off voucher for STEAM’s picture library.